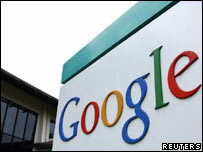 Web giant Google is planning a massive online storage facility to encompass all users' files, it is reported. The plans were allegedly revealed accidentally after a blogger spotted notes in a slideshow presentation wrongly published on Google's site. The GDrive, previously the subject of chatroom rumour, would offer a mirror of users' hard drives, Reuters said. Google declined to comment on the reports but said the slide notes had now been deleted. In the notes, chief executive Eric Schmidt reportedly said Google's aim was to "store 100%" of users' information. The notes said: "With infinite storage, we can house all user files, including e-mails, web history, pictures, bookmarks, etc; and make it accessible from anywhere (any device, any platform, etc)." "We deleted the slide notes because they were not intended for publication," Google spokeswoman Lynn Fox said. "We are constantly working on new ways to enhance our products and services for users, but have nothing to announce at this time." Under the alleged scheme, if users suffered a crash and lost files, Google's own computers would have kept a back-up. The plan for total online storage could meet difficulties with bandwidth constraints for some users. The search giant recently decided to offer an optional facility that stores a copy of the text-based sections of each user's data on Google's own computers. What do you think of the GDrive plans? Do you think it is a good idea to store such details on Google computers? Would you use this service if it was offered?